In the words of Josh Raynolds from Vinous, it is "A wild, complex bouquet (that) evokes ripe dark berries, succulent herbs and potpourri, plus a hint of smoked meat in the background... blueberry and cassis flavors are firmed by a spine of juicy acidity. 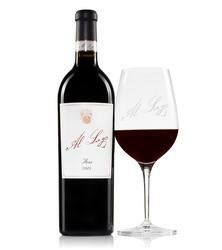 Deep yet lively as well, displaying excellent finishing clarity and supple tannins." Youthful purple. A wild, complex bouquet evokes ripe dark berries, succulent herbs and potpourri, plus a hint of smoked meat in the background. Sweet and expansive on the palate, offering sappy blueberry and cassis flavors that are firmed by a spine of juicy acidity. Deep yet lively as well, displaying excellent finishing clarity and supple tannins. A blend of 95% Syrah and 5% Cabernet Sauvignon, the 2015 Aria reveals a medium to deep garnet-purple color and nose of black forest cake, warm black plums and cassis with hints of dark chocolate, dried Provence herbs, black pepper and spice box plus a waft of charcoal. Medium to full-bodied, the palate is packed with expressive black fruits and spicy layers, supported by ripe, rounded tannins and plenty of freshness, nishing with great length. Produced by Guillaume Fabre of Clos Solene, this is a wine of fantastic elegance and sophistication, though sadly only 65 cases are available. The 2015 Aria is a Syrah dominated cuvée (there’s 5% Cabernet Sauvignon in the blend) that sports an inky color as well as classic, meaty, olive-laced dark fruits, hints of vanilla oak, medium to full-bodied richness and a broad, concentrated style. It has tons to love. This cuvée spent 16 months in 50% new French oak.